“SUNK!” By Mochitsura Hashimoto. Introduction by Captain Edward L. Beach, USN. During World War II, Commander Hashimoto was the skipper of several Japanese submarines including; RO-44, I-158 and I-58. He saw action in many crucial Pacific operations. But Hashimoto’s greatest victory came while at the command of the submarine, I-58 when he torpedoed and sank the American cruiser USS Indianapolis (CA-35). This sinking was the greatest single disaster in the history of the U.S. Navy as 883 American sailors died. The Indianapolis was also the largest ship ever sunk by a Japanese submarine! 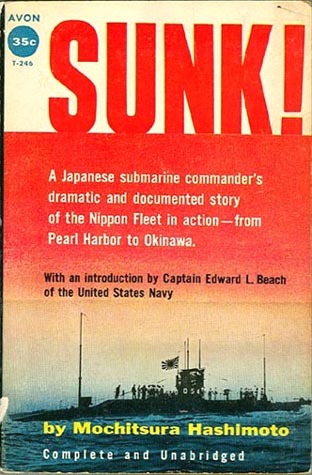 This is the story of a lost cause, the Japanese submarine operations in World War II. Covering each phase of the Battle of the Pacific from Pearl Harbor to Okinawa, written by one of four Japanese commanders who survived the war. One of the most difficult World War II submarine books to locate and without a doubt, one of the best. 1954 first edition Paperback. 190 pages, diagrams and an index but no photos. 29 page appendix.